Thank you for inviting me to speak. I had not come at all prepared, so I may be less than fully coherent. I want you to excuse me if that happens. A representative image of Student protest. My first and crucial point is, such protests need to recognise that we live in a different world than the one I inhabited when I was a student in this very University. In those days the left was stronger, anti-imperialism and anti-racism were stronger. Today, the right is stronger by far. As a result, its ideology has reached out to vaster masses and confused them. 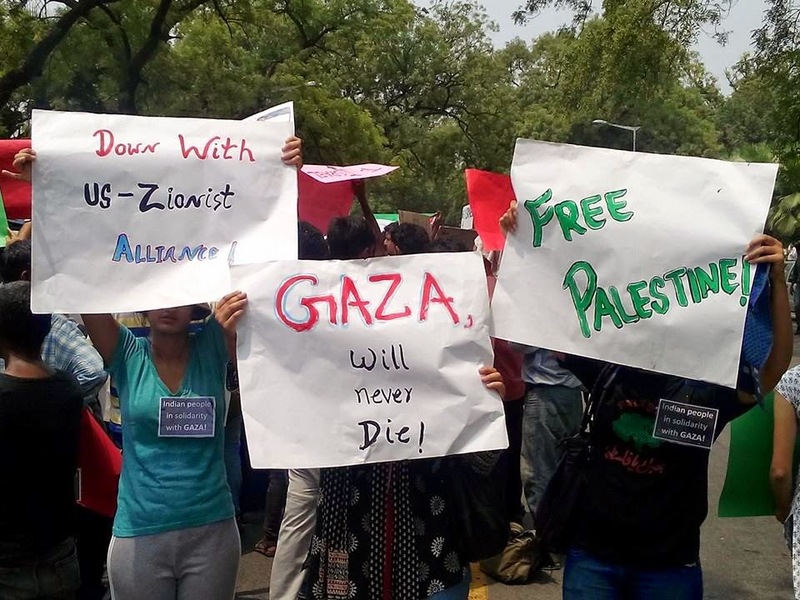 When we protest over Palestine, as I have been doing, we must pay heed to this reality and respond to false issues and non issues that they raise, because not everyone spouting those arguments is a diehard Hindu communalist, Zionist, or imperialist agent. Rather, a great many are reeling as a result of the huge rightwing ideological offensive. A standard argument is so called humanist pacifism. We are attacked, and told that all violence is violence, so why are we not condemning Hamas and its violence. This calls for a response at several levels. First, it is untrue that Hamas has started the violence. I am not talking like children, about who hit first. I am saying this for a deeper reason. As long as you cannot prove, in a court of law, who killed the three Israeli youth, it is fraudulent to blame Hamas. It is being done simply because Hamas and Fatah were about to come to an agreement, and Israel wanted to block that. Second, there is a clear difference between Israeli violence and anything any Palestinian is doing. Israel has adopted a policy that is called collective punishment. This is a policy we know too well. After the revolt of 1857, the British killed youth by the entire village in Awadh and other areas, not because they were convicted of anything, but because they were young people of target regions. For Israel, the most important parallel does not come from India though. It is a shameful and tragic thing, that those who say they are Jews, are adopting the policy adopted by Hitler. In retaliation for the killing of the Nazi leader Reinhard Heydrich, the Nazis carried out collective punishments in Czechoslovakia. One village wiped out was Lidice. On 10 June 1942, all 173 men over 15 years of age from the village were executed. A further 11 men were killed a few days later. 184 women and 88 children were deported to concentration camps. At the end of the war, only 17 of the children and 153 women returned alive. Third, to reduce the debate to yesterday, to forget at least the whole post 1948 situation, is criminal. Israel was created through a UN intervention. But why? If it is because Jews needed a homeland, why here? The only claim the Jews had to Israel was that it is their biblical homeland, and supposedly one that God (Yahweh or the Tetragrammaton) had promised to Moses. As a firm atheist, I accept this no more than I accept any fable of promises made by Vishnu or others in the Hindu pantheon, or the promises of Allah. The historical record says Jews were thrown out of this area by the Romans, not the Arabs. The first significant Jewish resistance was stamped out with ferocious brutality in 66-73 CE. Simon Bar Kokhba’s rebellion was also defeated. As a result, Roman violence was considerable. This only increased when the Roman emperors became Christian. It was only after the conquest of the regions where the Jews lived by the Arabs that things changed for the better. When the Christians in the middle ages wanted to conquer the “Holy Lands’, that was not for the benefit of the Jews, but of /christinas. Jews were mercilessly treated by them. From the First Century CE, Jews had been driven out in large numbers from Israel, and till 1948, the bulk of Jews lived outside their so-called homeland. Jews had been systematically repressed in Christian Europe. The nature of repression changed. In the middle ages it was based on religion. Modern racism, where a descendant of a Jew was considered a Jew even if the person was not a practicing Jew, has links with the past, but is distinct. If you want to check who was more hostile to Jews in the middle ages/ early modern times, remember, Jews lived under Moorish protection in Spain. After the reconquista, 200,000 Jews were thrown out of Spain, and 50,000 or more forced to become Christians. A few years later, Torquemada would torture and murder some 2000 of them for real or assumed crypto-Judaism. The climax came with Hitler and the Nazis, who killed six million Jews during the Shoah. Partly to put an end to the guilt feelings of Europeans, partly to keep West Asia under control by installing a colonial-settler state, imperialists agreed to the Zionist demand for creating a Jewish state of Israel. While it is supposed to be a democratic state, in fact it is a religious state where Jews have priority, proved above all by the so-called Law of Return, by which anyone who is a Jew or is married to a Jew has the right to return (ha) to Israel. Even the 1947 UN proposal called for handing over 55% of the land to the Jews (bad enough as at that time they owned only 7%). But by the end of one round of wars by Zionist armed forces, they captured 77%, and eliminated at least 418 Arab villages. After the 1967 war, most of Palestine was controlled by them and even more Palestinians were refugees. So if, after moderate agitations failed, the Palestinians did become violent occasionally, it cannot be compared at all with the systematic Zionist violence on the Palestinians. I will not speak at much greater length. But I want you to think about a few other issues raised. Where were you when the Boko Haram was killing people? Where were you when Bangladeshi Hindus were being tortured and driven out? Where were you over the ISIS? these questions keep coming. We need to understand that these are red herrings, but explain it carefully. Some of us have protested. For example, when under Khaleda Zia Hindus were persecuted, it was raised in the Indian Parliament not by a BJP leader, but by CPI MP Gurudas Dasgupta. The real issue is, why are these questions being asked NOW? Because, this is an attempt to attack the mobilizations over Israel’s attacks on Gaza. I have no objection to someone organising a protest over Syria, for example, or Bangladesh and ill treatment of Hindus by Zia. But I will look at the nature and slogans of the protest. Even over Israel-Arab conflict I will look at the language of protest. I will not oppose and condemn all Jews, but only Zionism and the Zionist state. I am anti-Zionist, not anti-Jew. Finally, I want to stress – we often belong to organisations and I see no objections to that. I am myself a member of a political organisation and those who know my politics will know it is far distant from the politics of those who have arranged today’s meeting. I came because of the issue, not the banner. So I appeal to students – if there is a possibility of similar positions, keep your banners separate, but mobilise forces jointly. The people of Gaza need such united protests. And in India, where pro-Israel forces are welcomed and pro-Palestine demonstrations are brutally attacked by the police, united, mass shows of resistance are essential. Kunal Chattopadhyay is a Calcutta based historian. Currently he is a Professor of Comparative Literature at Javadpur University.